New green wheelie bins for recycling rubbish will start to be delivered to Lambeth homes this month. Most people who currently use transparent plastic sacks for recycling will get a new green bin. A few households will continue to use transparent sacks – for example people living above a town centre shop. For more information see: https://www.lambeth.gov.uk/greenbins The new bins were piloted last year in the Herne Hill area. The new bins will reduce rubbish on the streets and save the council nearly £1/2m a year. 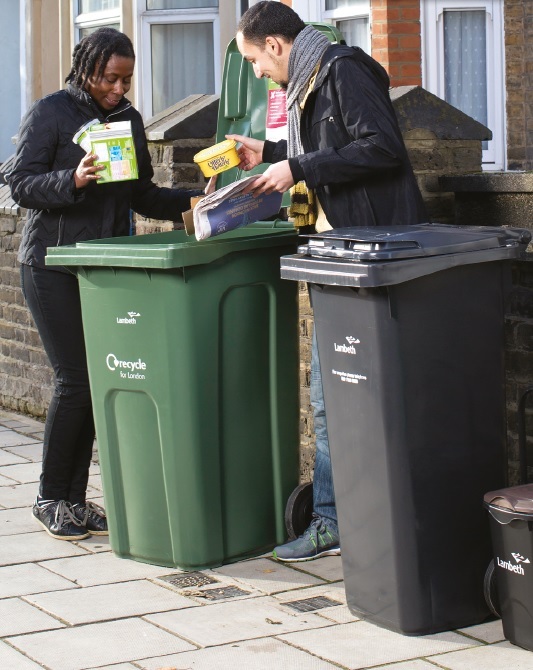 Lambeth collects paper, card, glass, cans, plastic containers & tetra pak from the door step. The food waste collection will continue and the garden waste service for people who subscribe. Collections will remain weekly. What happens if there is too much recycling to fit into the bin? Bags are much more efficient…. The green recycling wheelie bin is designed to hold a lot.The standard sized 240-litre green recycling wheelie bin, that most residents will get, can hold the equivalent of five clear recycling sacks. Flattening cardboard boxes & squashing plastic bottles and stacking similar sized items, such as yoghurt pots or plastic food trays will also help. No bags should go in the green wheelie bin.